Our 4 Stage Lineup is still TBA check our links below! 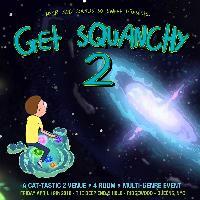 On Friday April 19th in Brooklyn; NYCRavers and Sounds So Sweet are going to open a portal to the Squanchiest party ever squanched this side of the Promethean nebula! Armed with multiple out of state headliners we are combining H0L0 and The Deep End to deliver 4 themed stages that will certainly TEAR A HOLE IN THE VERY FABRIC OF SPACETIME WITH HOW AWESOME THIS PARTY WILL BE.